Earrings "Deep Within" - RESERVED!!! In India, Moonstone has always been considered a stone of lovers and that is why it has been a desired gift for those getting married. Moonstone is supposed to bring harmony into the marriage. In Europe, it was believed that Moonstone helps reconciliation between lovers who have gone apart. The keywords of Moonstone are enchantment, intuition, insight and self-discovery. Moonstone carries feminine energy, and in men, it helps to activate the right half of the brain, discover their feminine side and thereby become wholesome. This crystal is a perfect assistant to men who are too masculine, and to aggressive women as well. For centuries, Moonstone has been used to contact the energies of the moon. The rhythms of the Moon play an important role for all those living on Earth and Moonstone helps us understand the cycles of life and their importance. Every cycle that we live through increases our wisdom, beliefs and knowledge. Moonstone also develops our intuition and makes our psychic abilities grow. In addition, Moonstone has a calming effect, it relieves anger and helps to see the reasons behind our problems. 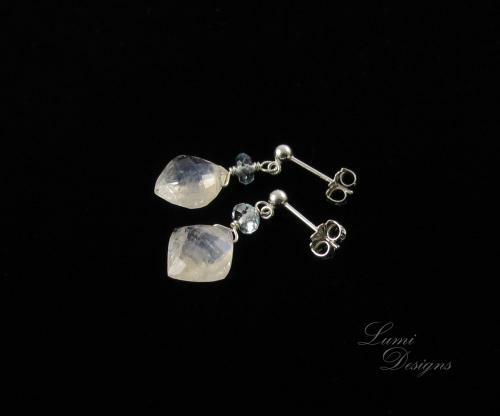 Moonstone heals insomnia and improves digestion, regulates the menstrual cycle and facilitates becoming pregnant. It is a great stone for the time of giving birth and for the period of breastfeeding. Throught times, topaz has been a highly valued gemstone. In ancient times, it was believed that topaz strenghtens mental abilities and avoids developing mental illness. It was also used to enhance vision and people used to believe that this crystal helps to acquire the favoritism of kings and others holding power. Blue topaz is the crystal of truth, wisdom, peace and prosperity. It brings out one’s feelings and thoughts in a truthful way. Blue topaz helps those who fear public speaking to remain calm. It smoothly opens the chakras of throat and third eye, and thereby makes it easier to express oneself clearly. Blue topaz also cures sore throat and migraine. It strengthens nerves and digestion as well.